We are finally in October. I say finally because September seemed to creep by, and I’m hopeful that my weather gets on board with the idea of October and cools off a little bit. One can hope, right? October first is an interesting date for me, particularly when it comes to Duran history. I have not checked thoroughly, but I tend to believe that I have seen more Duran-shows on October first than any other date during the year. The idea that I’ve been to that many shows over the course of a lifetime to even compare is ridiculous. However silly it may be, it is true. Even better, each show I’ve been to on October 1st has taken place since 2005. For my next trick, I will age some of you! Do you remember the Agassi Grand Slam for Children Charity show in Las Vegas? That was on this date in 2005. A wild weekend made hundreds of times more fun and memorable because so many of my friends were there. From field trips by limo to see an 80s cover band play, to get togethers in the bar and our own special brand of after party that went until sunrise, it was a weekend I will never forget. I could be mistaken, but I believe that it was the last time I saw Andy Taylor perform with the band. I don’t remember the show itself being very remarkable (aside from the foot pounding we did in the stands back in the “Duranie” section during Wild Boys). Isn’t it strange how those seemingly unremarkable moments sometimes end up as footnotes our history? So much has taken place during the thirteen years since, yet I can hardly believe it has been that long. In 2011, I saw Duran Duran play at the Sky Theatre in Valley Center, California. This was the first show I had seen since flying to the UK in May for shows that didn’t happen. I was very nervous about seeing the band again and for the first few minutes they were onstage I couldn’t even look at Simon. Amanda couldn’t fly to California for the show, so I went with my husband. As much as I love the guy, he had no understanding of what it felt like for me to be there that night. He didn’t get it, he’s never going to get it, and that’s that. Even so, the band was back and better than ever. I remember being shocked by how strong Simon’s voice was that night, and I still believe he is a stronger, more powerful singer now than he was before that mess with his vocal chords earlier that year. As for the rest of the band, well, I think the entire flow of events that year gave them a new appreciation for their craft. I know I certainly appreciate them. Seven years went by in the blink of an eye. Then there was the Hollywood Bowl in 2015. That show remains as something out of a dream for me. Truth be told, Amanda and I were willing to break the bank to get the best possible seats for that show, and from our second row center chairs that night, we saw the first of many shows on the Paper Gods tour that night. The Bowl is a very special place, filled with a lot of personal memories for me, but knowing that I finally saw Duran Duran perform there, is at the top of the list. It nearly erases the memory I have of driving up the Grapevine that night after the show, knowing that many of my friends had gotten invited, or made their way into the after party for the band that night. Lucky souls! Can you imagine it has already been three years? The moral here, of course, is that time flies. I have the luxury of taking the time to think back and take stock in those seemingly small moments. I mean, Duran Duran only played four songs that night in Las Vegas. I remember seeing Andy on stage that night, but I didn’t necessarily take special notice. Would I have done it differently if I’d known it would be the last time I’d see him with Duran Duran? Who knows? If I’d realized that so many of my friends got into the after party at the Hollywood Bowl, or that someone would have gotten in me in there if I’d asked – would I have stayed? Who really knows? Lamenting history isn’t helpful, but what I find most poignant and worthy of tucking away is that those tiny little moments and memories matter. Sometimes, they might even determine what comes next. Can’t We Just Love Them All? I touched on the whole guitarist debate yesterday, and I realized I had something else to write. Why does it really matter? 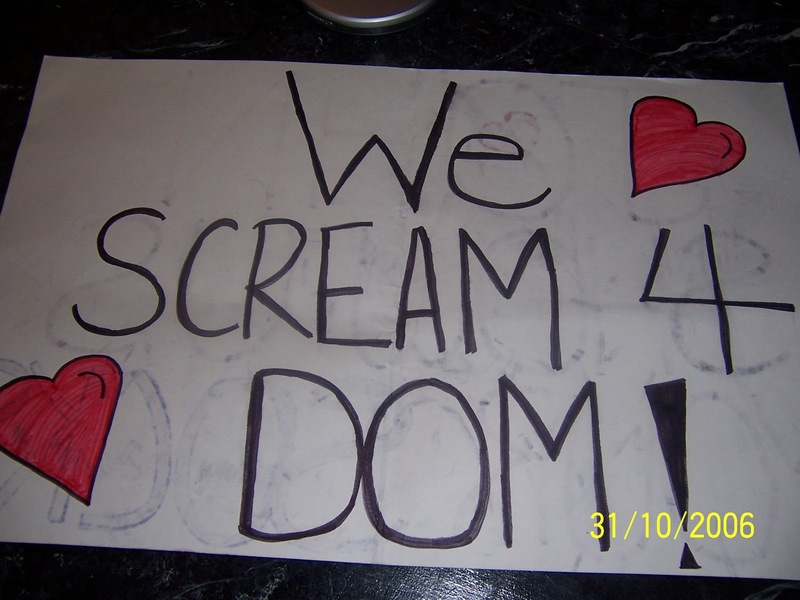 What is it about Andy, Warren and now Dom that makes all of us feel the need to debate their worthiness? Let’s face it, Andy was with the band during much of their climb to the top. He helped write many of the songs we continue to hear on the radio, and in their live shows. There’s no denying any of that, and I don’t think anyone is trying to rewrite that history. However, there’s also no debate that Andy has left the band at this point. He did his job, and from everything that I can see, it would appear that he’s happy to remain outside of Duran Duran. On the other hand, Warren took up where Andy left off. While Andy was chasing a solo career, Warren made himself available and willing. He wrote a lot of the music that many love most, and at least two of the songs that are still played most on the radio. No one is trying to rewrite THAT history, either. However he too is no longer in the band at this point, regardless of how that happened. Lastly, there is Dom, who is not a band member in the same respect as the other two. He began as a studio musician, a hired “gun”, so to speak, standing in for Andy while he was sick. Then again as Andy was away due to his father’s death, and carried on after he quit. He has been given writing credit on a few of the band’s albums in the years since, and while many have settled in with his presence onstage, still others choose to ignore what they cannot accept. After a lot of needless, useless time spent defending Dom over the years – he doesn’t need defending – I realized that it doesn’t matter. Andy and Warren are ex-bandmembers. They no longer play with Duran Duran, no matter how amazing they were. There’s no debate there, even though I know that some fans are intent on having one. Even if Dom weren’t with the band, it would still be someone else other than Andy or Warren playing guitar, and we would still be hearing that they aren’t as good as <fill in the blank here for whatever the reason>. It is a pretty unfair battle when you think about it. Can’t we just love them all? The other day Duran Duran tweeted a question about how they celebrate anniversaries of songs, albums, etc. and then asked fans what DD dates they commemorate. Immediately, I responded about how I like to remember my concert show dates. In fact, in our homemade Duran calendar, the dates and locations of each show that Rhonda and I have attended, together or separately, is listed. Today is one of those dates for me. On this date in 2005, I saw Duran play in Detroit. It was the last of my spring Astronaut shows and the end of an amazing Spring Break in which I saw five shows that week. More significantly than that, it was the first show I saw with all five original band members. At the time of Astronaut’s release, I remember feeling so behind the curve because I had yet to see the Fab Five live. It seemed so many other people I knew saw all of them in 2003 or 2004. Unfortunately, that wasn’t in the cards for me so I had to wait until Astronaut. In December, tickets were purchased and a countdown began. January and February felt like the longest months ever. During that time, I kept my excitement about seeing all 5 mostly to myself. I didn’t want to point out that I wasn’t a cool fan like all those who saw reunion shows. Then, finally, my part of the tour approached only to find out that Andy had to fly back to the UK to take care of his dad. Obviously, I understood but was disappointed. Others around me expressed that while I quietly convinced myself that I would still enjoy the shows, which I did. By the time the third show came, I stopped hoping that Andy would return. I reassured myself that this was just one tour and that the band would be back around. Yet, I was stunned when my friend called the day of the Detroit show telling us that Andy would be there for the show! I cheered along with my friends and my excitement of the show increased immensely! Indeed, it was a special show and have a fond little spot in my heart for it. As I drove home the next day, I found myself feeling very, very lucky to have been able to see the Fab Five live and it didn’t matter that it was in 2005 rather than 2003 or 1984. I did it. Speaking of lucky, I believe that I have been a very fortunate Duranie in that I have had the opportunity to see the band live with not only Andy, but Warren once and Dom a bunch of times. The debate of Duran’s guitarist will probably never die. While I personally love Duran as it is right now and feel strongly that Dom should definitely be there, I appreciate the history that came with Andy and the creativity that came with Warren. I know that each guitarist has brought something to Duran that cannot really be measured. So, on today’s date, I celebrate not only the Detroit show that took place 13 years, but also the guitarists that have been a part of the Duran story. Denying the reunion of the original five, 2001. As I was looking at our Day in Duran History spreadsheet (yes, we actually have one! ), I noticed that on this date in 2001 – there’s an entry that says “dd.com denied a tour with the original five on this date”. The real story is that the day prior – March 19, 2001 – allstarnews.net broke a story about the original five (Simon, Nick, John, Roger & Andy…in case you forgot!) touring together. DDHQ, or duranduran.com, was quick to announce on this date in 2001 that such rumors were completely untrue. Except of course they weren’t. Management calls a promoter, perhaps forgetting to have them sign a NDA (non-disclosure agreement) before getting them under contract to put together a tour for Duran Duran. It could have been that they actually did have them sign one, but as the promoter contacts venues who may be interested in contracting a gig with the original five members of Duran Duran, who haven’t performed together since the 80’s – the news was expertly leaked to a news site. After all, HELLO, this story was huge! Said news site does their job and broadcasts the news on the ‘net. Even without social media, it takes almost no time before this headline reaches Duranies around the planet, who begin to fall off of chairs while typing the word thud on message boards and forums around the world. Meanwhile, DDHQ is found taking Advil, Tylenol and/or Paracetamol, while needing a lie down with a cool compress. It is decided that, rather than admit to the Fab Five reuniting and losing full control of the narrative, and how it will be unfolded to the world, it is best to deny the story completely. The words saying as much are posted on dd.com for all to see. Meanwhile (most) Duranies skip the Tylenol, Advil and Paracetamol and go straight for shots of whatever hard liquor is available. Vodka shots, anyone?? Or maybe that’s just MY version of the story. Of course, we all know how this turned out, don’t we? It would be two years before the band actually started to do shows together, but yes – the original five DID reunite – and it was a bright and beautiful time to be a fan. This story is also why, even when DDHQ denies, or even better, full-well ignores rumors and questions about rumors, fans don’t necessarily listen – in fact I’d argue that it just forces fans to do more sleuthing and investigating on their own. I suspect that this might where the “relationship” between DDHQ and fans started to go really wonky, although there were certainly signs of that prior to 2001. While it is really neither side’s fault – DDHQ did need to protect their ownership of such a huge breaking story, and fans had the right to be excited by such a bombshell announcement – I think it makes it difficult to work together at times, and perhaps that alone is part of the problem. Are we (fans) really just a problem that needs to be handled, or are we people who can be trusted to be there when it counts? I’m not quite sure. Regardless, the distrust is palatable, and pretty unfair, both ways.